Beer Hearn Shinjiko Moon Honey Weizen Bock is one of those beers that deserves respect. Weizenbocks are notorious for doing my head in, for example, on the recent trip to Craft Beer Bar iBrew, I had one too many, and this beer is no exception. Beer Hearn Shinjiko Moon Honey Weizen Bock takes a regular weizenbock and has a truck load of honey added to it along the process, possible increasing the alcohol content the longer it is stored. I don’t know if that is true or not, but that was my excuse when I was stumbling around after two cans of this. Remember those days of drinking Calpol as a kid? Here it is in adult form. Beer Hearn Shinjiko Moon Honey Weizen Bock had a murky bronze orange colour to it that didn’t appear to have any sediment or particles in it. The head was not significant, perhaps a finger tops but the aroma drew me in like a bee to a flower. The nose was a cataclysm of smells going on, I could imagine bees being confused with what was going on in this beer. Honey. Bananas. Cloves. Alcohol. Malt. My nose was being battered and bruised by the assault. Every time I came close to drinking it, my nose pulled away at the last moment. Should have taken the warning before drinking it. The taste. Well, for some reason Calpol came to mind. A slight medicinal twang to it sent me reeling back to those childhood days of being dosed up with damn Calpol to reduce a fever, pain, energy, craziness, or whatever ailment my parents thought I had. Once I had gotten over those repressed memories, Beer Hearn Shinjiko Moon Honey Weizen Bock was nice. The alcohol was noticeable but not overpowering as the honey and wheat notes quickly pushed it to the side. It had a bit of a bitter aftertaste with the honey lingering on the taste buds and I was hooked. Beer Hearn Shinjiko Moon Honey Weizen Bock packs a punch that will confuse, confuzzle, and coerce you. Buy it and savour it. 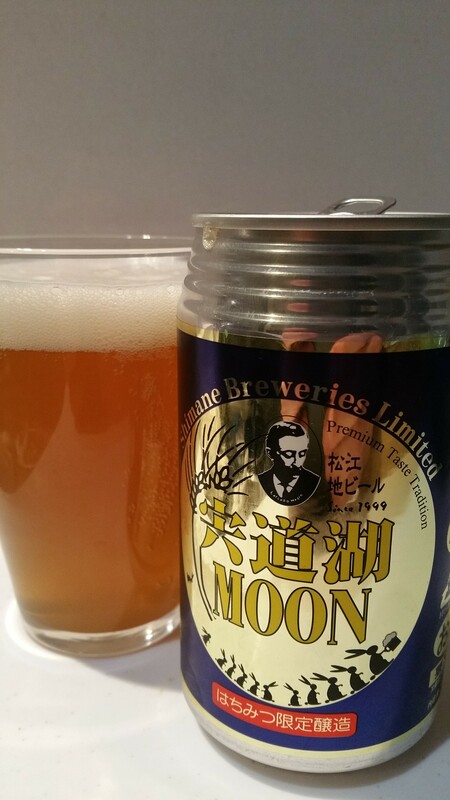 We got our can of Beer Hearn Shinjiko Moon Honey Weizen Bock from Le Collier in Tokyo station. It can also be bought on the Shimane Beer online store here.